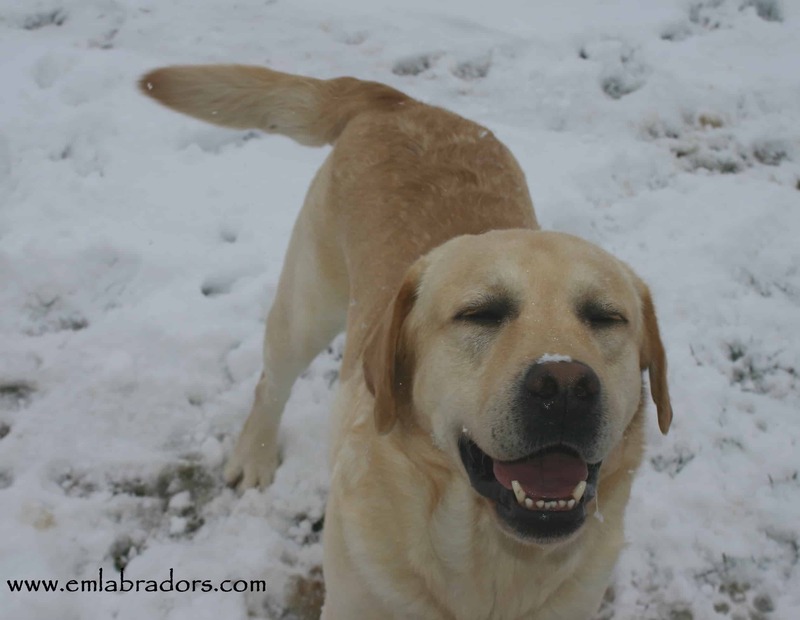 Cold Winter Safety Tips for Your Labrador Love! It’s the most wonderful time of the year!! 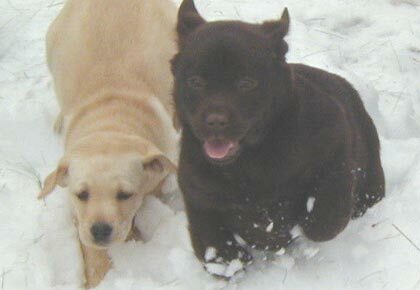 To be a lab that is… Labradors LOVE the snow! They will play, play, play all day long in this fluffy white stuff if you let them! Even though Labradors are indeed bred for the cold weather and to swim in icy waters with that thick double coat, know that it can in fact be TOO cold for your labby to be outside… and there are certain safety standards you should always follow in the wintertime. Make sure your lab ALWAYS has access to drinking water while spending time outdoors ANY time of year. And here’s a pretty (should be) obvious tip… if their drinking water has frozen while outside… they’ve been out TOO long!! Watch for icy spots in your yard or the sidewalk while walking with your canine companion. The pads of his/her feet can be very sensitive to that slick ice and get very sore. Not to mention the salts and chemicals used on roads and sidewalks can crack pads too. It’s a good idea to make it a habit of wiping your pup’s feet off when you bring him/her indoors, as well as wiping off their underbelly and lower legs. It’s important to be conscious of your lab’s health, always, but especially at this time of year. Cold temperatures can aggravate arthritis and other health issues in dogs. Be ready for warm cuddles after playtime outside! To bring home your own Endless Mt. Lab in time for snow angels and fetching snow balls, click here! Rinsing feet and bellies is a great idea when you have been out walking where ice melt chemicals are. I also use Musher’s Secret on Maxx & Emma’s paws a couple of times per week. It not only protects their feet but also keeps them soft! My 2 have had a blast playing in the snow this past week and there has been some very loud snoring every night! Hello there! We just recently adopted a Labrador from Guatemala! We live in Utah, so this will be her first winter. I found you through YouTube, LOVE your videos, I also got the kibble you recommended. Our black female lab is 16 months, do you think I should get her a coat/jacket and some boots for this winter? I have lived in Northern Utah for years. I have a 7 year old lab. He does fine in the winter here. In fact, he prefers to go lay in the snow to take naps than go into his heated dog house or come inside. Does your lab stay outside all the time? We are also in Utah, and just adopted a lab a couple of months ago. We have a dogloo for him with a big, thick bed inside it that he sleeps on, but we’ve been bringing him inside if it gets below 20 degrees. The problem is that he hates sleeping in his crate inside, and whines all night. He prefers to be in his dog house outside. Would he be safe outside in, say, 10 degree weather so long as he’s in his dogloo? How cold do you let it get before bringing your dog in? I would think most dogs would hate a crate. Why put a dog in a crate? sounds crazy to me. It is called crate training a dog, if trained from an early age then they associated the inside crate as their place to sleep. It is normally used for people who want to make sure their dog doesn’t have the roam of the house at night or doesn’t sleep on their own bed. degrees tonight? Can they handle it? I know they have a fur coat. I’m just worried.. I don’t know if I should bring them inside when they love and are use to being outside. Can you help? My lab just turned 5, a week ago and spends 99% of the days outdoors. We used to bring him in when it’d get close to 0F but he’d just sit by the patio door and whine. He’s made it through a couple of days where it’s below zero, maybe -1F/-2F but we do feed him double the amount of food during this time of year to keep the fat on him. He’s probably close to 95lbs. Anyway he’s made it through a -8F night a month or so ago but tonight it’s going to get a bit colder than that so I brought him in. He’s in a detached garage with a couple of blankets (that he ultimately rips the stuffing out of) with a blanket over the top of his kennel. He’s also tucked away under a work bench out of the wind so his body heat doesn’t dissipate easily. But petting him while its -1F, his fur wasn’t that cold. Even so I just didn’t feel comfortable leaving him out there. So now he’s down in the basement where he and I can sleep comfortably. He’s such a tough loveable dog. Not an expert here, just curious as to what answer you would get from an expert, then re-read tip #1 <<if their drinking water has frozen while outside… they’ve been out TOO long!! My girlfriend lives with her mother and sister. They have a black lab, and the mother insists on the dog existing and sleeping outside nightly. This is the Midwest, so it gets cold. Really cold. And often. I’m not sure what to do, and options are limited. I’ve battled on the dog’s behalf for over a year but no consistent behavior changes have stuck with the family. What should I do? Kidnap the dog and bring it to a shelter? Call the cops? I desperately want the sweet pup to have a better life. Kidnap the dog, Call a Animal Abuse Officer in your area. All good ideas. Heartless idiots like that are the scum of the earth. Animals view the outdoors and weather differently than we do. We’re kind of accustomed to 72 degrees year-round, eh? 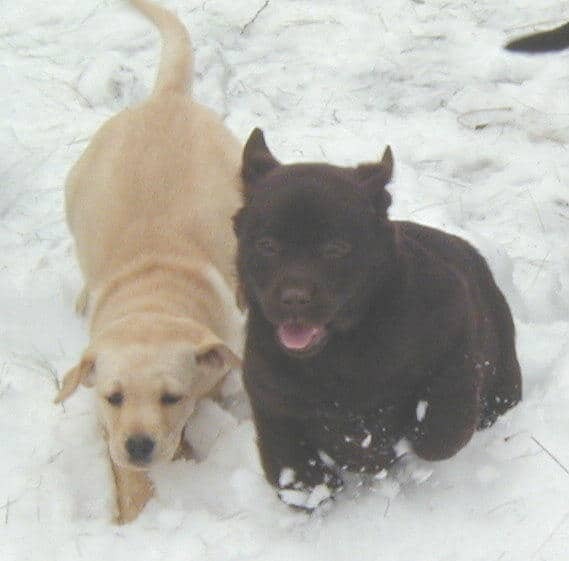 Our 2 Labs have done fine outdoors in all seasons. We have brought him inside the (unheated) garage if the temp gets down below 20-25degrees. Make sure they have fresh water and a good doghouse that is sheltered from the elements. And take them for walks twice a day if you can. They love people. How cold is too cold for a lab to go swimming? We are in Los Angeles so the weather is not nearly as cold as a lot of places but our pool isn’t heated so the water temp is not usually what I would consider a comfortable swimming temp during the winter. Of course labs are more tolerant of cold than humans. I’ve asked 2 vets and neither could give me a definitive answer. but it will feel like -12 degrees Celsius(10.4 farenheit) whatever that means. Should i take her in tonight? I’d take her in. But she’ll be fine if u leave her out. It’s been a while since u posted now so I’m curious: what did u do? Playing fetch in the open water! You are incorrect Sir. Dogs have 10 times the tolerance & pain threshold of people. So, they feel a tenth of what we do. So, they will not be as cold as we would be out there. It is not torture to the dog, despite what you think. 23 degrees Fahrenheit is perfectly fine for a healthy lab/retriever who has a suitable outside shelter. But you don’t live in a cold weather climate so I’ll chalk your response up to no experience. Just don’t berate someone based on your personal feelings. The person did do the responsible thing by asking the question & attempting to find a solution. Ease up bro!! I have an irish wolfhound/lab blend. He loves the cold weather, playing in the snow. When he knows there is snow on the ground and i have to leave him behind he will whine off and on until i get home to take him back out in it. If i put him in my car with his coat on, people freak out claiming its abuse. If i head anywhere near the car on a walk he runs over and wants to load up. Yet can not always take him with me. Any advise?